Final Spot Round Admission - M.Tech in Computational Biology (CB), on June 28, 2016(Tuesday) at IIIT-Delhi for approx. 10 seats. Note: The selected candidates will soon receive the offer letter in their registered email ids. Note : Now Shortlisted candidates will be able download the Admit Card from the below link. The date of the written Test and Interview is June 15, 2016(Wednesday) and the reporting time will be 7.30 am. Other details are given in the Admit card. 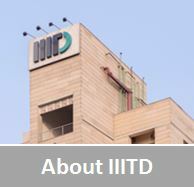 IIIT Delhi was created by an Act of Delhi Government in 2008. Since then it has gained a high degree of respect within the academic community, and is widely regarded as one of the top Institutions in the country for research and education in IT and allied areas – in particular Computer Science and Engineering (CSE) and Electronics and Communications Engineering (ECE). Computational Biology (CB) is the new program that we have started from last year. IIIT-Delhi faculty is among the finest in the country (all regular faculty members have PhD, with about two-thirds of them having PhD from the US or Europe), and it attracts the best students to its programs.